Wing span: 1 3/8 - 2 3/4 inches (3.5 - 7 cm). Identification: Quite variable. Upperside of male yellow with orange overlay, yellow veins, wide black border, and dark black cell spot. Female yellow or white with irregular black border surrounding light spots. Underside hindwing spot silver with 2 concentric dark rings, and a spot above it. 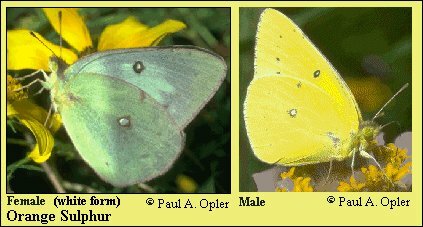 Life history: Males patrol for receptive females, who lay eggs singly on top of host plant leaves. Most feeding takes place at night. Young caterpillars chew holes in the tops of leaves, then later feed from the leaf tip. Older caterpillars eat half of the leaf before moving to the other half. Chrysalids overwinter. Flight: Two-three flights in the north from June-October, 4-5 in the south from March-November. Caterpillar hosts: Plants in the pea family (Fabaceae) including alfalfa (Medicago sativa), white clover (Trifolium repens), and white sweet clover (Melilotus alba). Adult food: Nectar from many kinds of flowers including dandelion, milkweeds, goldenrods, and asters. Habitat: A wide variety of open sites, especially clover and alfalfa fields, mowed fields, vacant lots, meadows, road edges. Range: Southern Canada to central Mexico, coast to coast in the United States except for the Florida peninsula. Comments: One of the most widespread and common butterflies in North America. Management needs: Caterpillars can be very destructive in alfalfa fields. for New Mexico Butterflies. Privately published. Albuquerque, N.M.